Three game minimum schedule guaranteed. To help you plan. Out of State teams Guaranteed Entry when application and payment submitted 30 days prior to event. The 2019 Irvine Memorial Classic Headquarters venue will be The Great Park, City of Irvine Fields. Click on a subject below to move to it or scroll down using the scroll bar on the right. I have a team that is not currently registered with CYSA-South. Can I participate in this CYSA-South Class One Tournament? 1) Registered with CYSA-South in the 2018 / 2019 season. 2) Registered with CYSA-North in the 2018 / 2019 season. 3) Registered with any USYSA League in the 2018 /2019 season. 4) Registered with any USSF member organization in the 2018 /2019 season. I have a player that did play on my team last year. Can they play? Yes. There is unlimited loan players. However, all players must be Cal South registered. 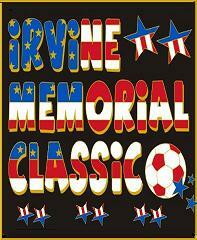 When is the last date a team can sign up for the Irvine Memorial Classic? There is not an application deadline. Brackets are completed by a first come first served basis with teams of equal ability. How about a discount price? Teams seeking financial assistance can e-mail an inquiry to the Tournament Director for consideration. Where will our teams games be played? The Irvine Memorial Classic main playing venue is Orange County Great Park, Irvine ( 6 fields )and other local venues are used when necessary. Playing venues are determined by the scheduler based on the quantity of teams entered in an age. Naturally, as soon as they are completed. We are projecting 5 days before the start of the event. Our coach is coaching two teams, will you arrange the schedule so he can coach both team's games? Please, let us know by e-mail and we commit to doing the best we can, without any guarantee. as a condition of entry. Will there be more than one Flight (bracket) for each age? Teams will be placed in flights according to a teams level of play and quantity of teams accepted. The objective is for teams to play teams of equal quality and to have every team have the possibility of winning before the game starts. There are five teams in our Flight. When is the Championship game? Flights with five teams play a round robin of four games. Award placement is based on the total points earned. One could state, every game, is a championship game. We have applied on line. When is our payment due and where do I send it? All teams apply on line and receive an auto respond e-mail with further instructions regarding payments, where to mail payments, etc. Can I sign up now and pay later? YES. Your application will be stored in our data base until your payment is received. Offically, your application will NOT be processed until full payment is received. When and where will teams check in? H Q tents will be located at both venues. All teams must check in 30 to 40 minutes before the start of their first game at the H Q tent at the field of their first game. NO Friday night check in. Yes, pins will be picked up at check in. Medals will be awarded to 1st and 2nd place teams in each flight. Medals must be pick up at the field H Q Tent after the final match is completed. Who will referee the games? As in all CYSA-S Class One Tournaments Referees are contracted by the tournament to a local Referee Organization. Most times the host Referee Organization seeks help from other local Referee Organizations. Naturally, we have requested the best referees possible to referee these games. Who will pay the referees? The Tournament picks up all Referee costs. We applied on line, sent in payment, were accepted, and were sent an e-mail of acceptance. Now we cannot come to the tournament. Can we get a refund? After a team has been sent an e-mail of acceptance to the tournament, no refunds will be issued. If a team withdraws before an e-mail of acceptance has been sent, a full refund is given. How about if a replacement team can be found? If the team withdrawing finds a replacement team, then that team can refund the original team's payment with the condition of the new teams Tournament acceptance . What is the Memorial Classic Rain Out Refund Policy? Cancellation of all matches 100%, less $100.00 administrative fee. Please click on the Team Roster Form below. This will open the PDF Roster Form. To complete the On Line Fill-In Roster Form place your cursor in the box, click and type. Print the completed form and bring it with you. Completed Roster forms will be verified before your first game. YOU MUST HAVE ADOBE ACROBAT READER TO OPEN AND FILL IN ALL IRVINE MEMORIAL CLASSIC FORMS. If you do not have the lastest version, 5.0 of Adobe Acrobat reader you can download it FREE from the Adobe website. NO PETS OF ANY SIZE OR AGE ALLOWED AT ANY TOURNAMENT VENUES. Exception: Certified seeing eye dogs or Certified seeing eye dogs in training. This is a facility rule. The Irvine Memorial Tournament Director above is available to answer any of your questions. Flights will normally consist of 8 teams with two pools of 4 teams each. Teams will play all other teams in their pool with the first place teams continuing on to the medal rounds, starting Sunday afternoon. The Championship game will be played between the teams who place 1st in each pool, with the winner earning the 1st place medal and the loser the 2nd place medal. Pool play begins Saturday morning and ends Sunday. (2 games Saturday and 1 game Sunday) Medal games will begin Sunday afternoon. Medals will be awarded to the 1st and 2nd place teams in every Flight. All teams entered are guaranteed 3 scheduled games. Due to time and field constraints all medal games will go directly to a shoot out, if tied after regulation time. When flights are less than eight teams, the format will change, however medals will still be awarded to the top two finishers. Teams are placed in flights based on the information received from the coach / manager entered in the application form. After the tournament application fees have been received, the application will be reviewed and the selection committee will determine the status of acceptance. After a team has gained entry, notice will be given, by e-mail. No refunds after acceptance e-mailed is sent notifying team of acceptance. More instructions will be given to all teams after gaining entry. 1) Unless otherwise noted below, FIFA "Laws of the Game" and USYSA playing rules will be used. 2) All games will be considered final and no protests will be allowed. 3) All teams will be scheduled for three games, with running time. The clock will start the scheduled kickoff time. 4) The length of the Birth Year 2008, 2009, 2010, 2011 games will be 40 minutes with a 5-minute half time. 5) The length of the Birth Year 2007, 2006, 2005, 2004, 2003, games will be 50 minutes with a 5-minute half time. The 10 point scoring system will be used. One point for each goal scored, not to exceed (3) goals per game. One point each team for a (0-0) tie. A forfeit win will be scored 1-0. Teams which forfeit any game in pool play could have all of its games played scored as 0-1 losses. Winner of head to head competition. Any game that determines if a team moves on to the next round cannot end in a tie and will be decided by FIFA penalty kicks. All Championship games that end in a tie will be decided by FIFA penalty kicks. All teams must provide properly laminated league, state passes or necessary loan and/or travel papers. A team shall consist of at least (8)players. Player cards may be checked and rosters verified before each game. Maximum of eighteen (18) players on the roster. All loan players must have the proper loan documents. Players, coach and parents shall be on opposite sides of the playing fields. Unlimited substitutions will be allowed on any dead ball. Any player or coach that is ejected from the playing area will be suspended for the next game. Depending on the severity for the reason of the ejection, the player or coach may be suspended for the remainder of the tournament. Three points will be deducted for each ejection that is recorded. If an unusual event results in a significant loss of game time, the lost game time may be rescheduled at the discretion of the Tournament Director. The rescheduling of the lost game time is subject to field availability. An example of an unusual event would be a major injury to a player, which prevented the use of the playing field. The Tournament defines a significant loss of game time as more than half of the game. An accumulation of time delays due to other injuries to several players would not constitute an unusual event nor will these delays be considered lost game time. An accumulation of time delays resulting from the normal course of a game will not be considered lost game time. Tournament Director / Site Manager may shorten games as necessary to make sure all matches scheduled on a given field are played. For example, a field running behind schedule due to an injury may have all remaining games shortened by few minutes each game so that each game gets played. Tournament Director or referee may suspend any match or tournament in consideration of safety to players or damage to fields in event of inclement whether under any circumstances. Please review Rainout policies. It is understood that after email acceptance to the tournament has been emailed, any refunds are at the sole discretion of the Irvine Soccer Tournaments. Total fees paid will be refunded to any team not gaining entry. Each participating player and coach will receive a Tournament pin. Tournament medals will be awarded to 1st and 2nd place teams in each flight. You are auto-directed to another page. Please read all information. Boys - Girls Play May 25 - 26, 2019. After pressing SUBMIT you will be re-directed to a new page. You will also receive a confirmation e-mail from us, that your data has been received. Please remember to visit your E-mail in box. Please follow the instructions in the e-mail from us. Please e-mail Irvine Memorial Classic with any questions. YOU MUST HAVE ADOBE ACROBAT READER TO OPEN AND READ ADOBE DOCUMENTS.